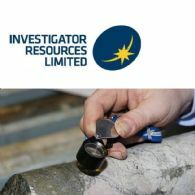 Investigator Resources Limited (ASX:IVR) is a metals explorer with a focus on the opportunities for greenfields silver-lead, copper-gold and other metal discoveries in South Australia. The Company's priority is progressing the development pathway for the Paris silver project with the preparation of a pre-feasibility study. The Paris Mineral Resource Estimate is 9.3Mt @ 139g/t silver and 0.6% lead, comprising 42Moz of contained silver and 55kt of contained lead, at a 50g/t silver cut-off. The resource has been categorised with an Indicated Resource estimate of 4.3Mt @ 163g/t silver and 0.6% lead for 23Moz contained silver and 26kt contained lead, and an Inferred Resource: 5.0Mt @ 119g/t silver and 0.6% lead for 19Moz contained silver and 29kt contained lead. The Company has applied an innovative strategy that has developed multiple ideas and targets giving Investigator first-mover status. 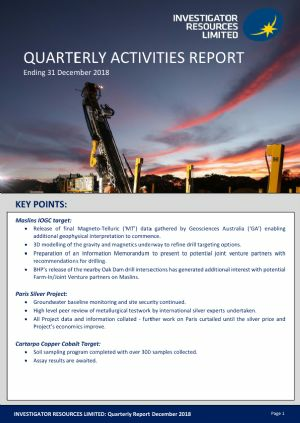 These include: the Paris silver discovery; recognition of other epithermal fields and the associated potential for porphyry copper-gold of Olympic Dam age; extending the ideas developed at Paris-Nankivel and using breakthrough government Magneto-Telluric surveying to rejuvenate targeting with the Maslins IOCG target as the next priority drill target. 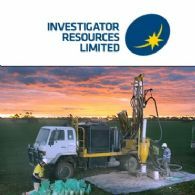 Investigator Resources Ltd (ASX:IVR) provides the Company&apos;s Quarterly Activities Report. 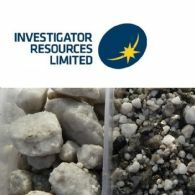 Investigator Resources Limited (ASX:IVR) is pleased to advise the appointment of Ms Melanie Leydin as Chief Financial Officer who will replace Mr Angelo Gaudio who has resigned as joint Company Secretary and Chief Financial Officer effective 31 December 2018. Ms Anita Addorisio has also been appointed joint Company Secretary. Investigator Resources Limited (ASX:IVR) is pleased to announce that Ms Melanie Leydin has been appointed as joint Company Secretary. Ms Leydin will commence the role on this day together with the currently appointed Company Secretary, Mr Angelo Gaudio. Investigator Resources Limited (ASX:IVR) is pleased to announce it has received A$657,958 as a tax concession for the 2017/18 year under the Federal Government&apos;s Research and Development ("R&D") Tax Incentive program. 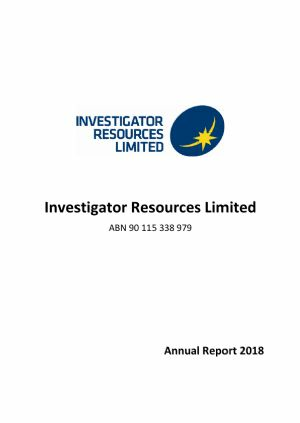 Investigator Resources Ltd (ASX:IVR) provides the Company&apos;s Annual Report to shareholders. 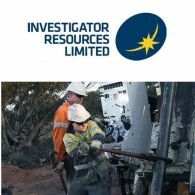 Investigator Resources Limited (ASX:IVR) is pleased to provide the following updates in relation to its previously announced reviewed corporate strategy and existing projects. 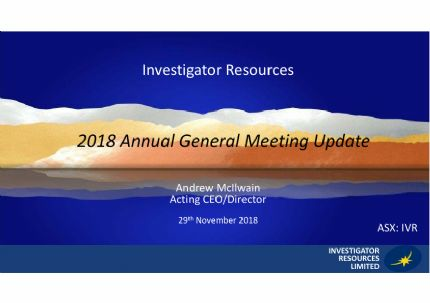 The Directors of Investigator Resources Limited (ASX:IVR) present their report for the year to 30 June 2018. 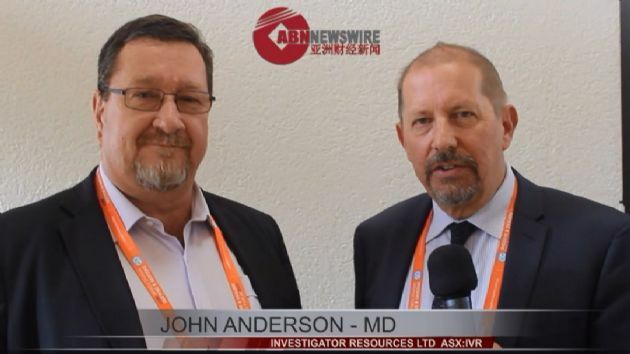 With the current activity and focus of Investigator Resources Limited (ASX:IVR), a mutual decision has been made for Mr John Anderson to step down from his long-term role of Managing Director and CEO.